The George IV State Diadem is paved nearly entirely in diamonds, save the pearl-lined base and the solitary four-carat canary diamond mounted in the central cross. This masterpiece features 1,333 white diamonds set in four bouquets symbolizing England (rose), Scotland (thistle), and Ireland (shamrock), as well as in four cross pattee. Framed between two rows of pearls, the diamond scroll work band was remounted in 1902 for Queen Alexandra, who grudgingly passed the diadem on to Queen Mary when her son, George V, was crowned king. It has remained among the Crown Jewels since Victoria bequeathed it to the state in her will. The George IV diadem was designed to encircle the Cap of Estate, an ermine-trimmed velvet headpiece which up until the time of King Henry VII was worn in lieu of a crown. King Henry VIII was the first king to wear the Cap of Estate in tandem with a crown. Just as Queen Victoria chose the diadem for her coronation procession, Queen Elizabeth II also wore the diadem on her way to Westminster Abbey. Queen Elizabeth II continues to favor the jewel, wearing it for the State Opening of Parliament each year. Philatelists also celebrate the diadem, which is featured on the first postage stamp ever made. The 1840 Penny Black, a rare and prized stamp, features Queen Victoria's young profile ensconced in her favorite crown. 1. The Wedding Tiara. "George IV State Diadem Royalty Tiaras." 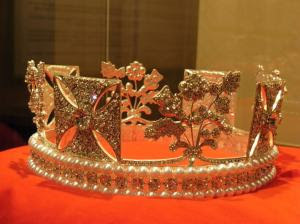 Accessed May 28, 2012. http://theweddingtiara.com/archives/george-iv-state-diadem. 2. Royal Exhibitions. "St Edwards Crown." Accessed May 28, 2012. http://royalexhibitions.co.uk/crown-jewels-2/royal-regalia/. 3. Butschal, U. "Queens Juwel Casket: Windsor Tiara's." Royal Magazin. Accessed May 28, 2012. http://www.royal-magazin.de/queenbrooch.htm. 4. Hardwick, Holly. "George IV State Diadem Crown." Queen of Crowns Blog. Posted September 9, 2007. Accessed May 28, 2012.http://blog.hollyhardwick.com/2007/09/george-iv-state-diadem-crown.html. *Victorian clip art courtesy of The Graphics Fairy.